Discovering Vancouver metal band Kooznetz (Russian for 'blacksmith') reminds me of encountering another young band, circa 1980, Def Leppard. Kooznetz's four members (of some Russian descent) range in age from 17 to 19 years old, and have been playing together, in some form or another, since 2005. Also, like there Brit cousins of yesteryear, this crew is quite talented and ambitious. All of the above is merely preface to say this: Kooznetz's debut work is an impressive and true heavy metal delight. The musicianship is creative and, generally, superb; they falter here and there, as on Stalingrad or Chemical Mirage, but with little impact. The song composition is thoughtful and dynamic as on Circles, the ethnic influenced Rasputin, and Spirit Of The Highway (even though it is sung in Russian). Kooznetz offers enough diversity in arrangements to be intriguing, avoid metal monotony, and encourage repeated listens. Additionally, I was impressed by the expert bass work and drumming from such young players. 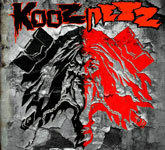 Overall, Kooznetz is a well thought and well played platter of melodic heavy metal. On the downside, only one thing tripped me up: the album packaging and artwork is horrible; other than their name, most everything else is difficult to read or comprehend (what is that thing below their name?). If I were Kooznetz, I would fire my art designer, management or both for this major stumble. At the least, Kooznetz should get several objective third-party opinions before proceeding the next time. Fortunately, all is not lost for this release comes with a DVD containing a music video and interviews with the band members. To conclude, Kooznetz's first work is an impressive debut filled with sterling musicianship and fine songs wrapped up in the best classic heavy metal style. Highly recommended! Kooznetz's first work is an impressive debut filled with sterling musicianship and fine songs wrapped up in the best classic heavy metal style. Highly recommended!